Visiting teachers from Mumbai who arrived in Nagaland on Saturday were welcomed on Friday at Unity College of Dimapur by the Governor of Nagaland PB Acharya. They were welcomed in a ‘people-to-people program for national integration’, an initiative of the governor himself. Educationists, intellectuals, and members of the business community of Dimapur district attend the reception. With the idea to strengthening emotional integration and bond between the people of various areas of the region through education, the 13 guest teachers are in the state a result of motivation by the Indian National Fellowship Centre. The Indian National Fellowship Centre is a nongovernmental organization based in Maharashtra and works for North East India. The inaugural program witnessed an exchange of ideas and expressions about the educational systems of both Maharashtra and Nagaland. During the course of interactions, one of the visiting teachers, Principal of Gopal Sharma International School Mumbai, Gool Ghariali said that the idea of the national integration program was initiated months ago. The governor of Nagaland PB Acharya proposed the exchange of literacy and teaching methods, she said. She said to be looking forward to learning more than the teaching. She also acknowledged teaching to be a noble profession in which teachers work toward molding better citizens and the success of every student. Teachers put in a lot of commitment which comes with sacrifice, Ghariali said. She said that the current generation was driven by technology and this facility had brought the world closer. Stating that the present generation was a ‘smart gen’, the principal impressed the teachers to be ‘smarter’. Taking the opportunity of the event, the gathered guests interacted with the visitors. Issues such as the poor quality of counseling management in the state, and even philosophical engagements on personal and emotional integration, figured in the interactions. President of the Muslim Council of Dimapur A Rehman also said that the council has started felicitating successful Muslim students. He acknowledged Nagaland to be one example in the country that offers education irrespective of religion ‘unlike other states where education systems are run on the basis of religion.’ He said that Nagaland’s brand of offering education should be followed. The visitors are on a ten-day stay (9th May to 19th May 9, 2015) in the state. They will be visiting Peren district and Kohima district and interact with intellectuals. This event will be one of the first interpersonal interactions between the educational stakeholders of Maharashtra and Nagaland. Interestingly, a team of highly-qualified and specialist medical doctors from Mumbai are in Jalukie and Peren town of Peren district. They are in the district since May 8 as a part of an exchange program initiated by the Governor of Nagaland, PB Acharya. The medical experts were in the district for a two-day free medical camp, one each in Jalukie and Peren town’s district hospital. Interacting with personnel of the state’s Information & Publicity department personnel, the convener of the team, Babulal Todi, said that the idea to hold a medical camp for the poor and underprivileged sections in the rural areas emanated from the president of the Rotary Club of Bombay (North), Dr. HS Palep, gynecologist and general physician. 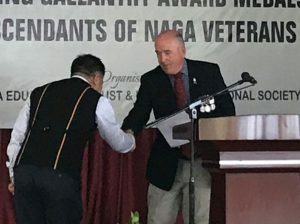 He said that all the travel expenses were being borne by the visitors except for the local arrangement which he said was being extended by the government of Nagaland. Each of the visiting specialist doctors conducting the medical camps are from different medical disciplines. Dr. HS Palep is a gynecologist and a general physician, Dr. S Agarwalla is a cardiologist and general physician, Dr. Anjali Patel is an Oncologist and ear-nose-throat specialist, and Dr. Lalita Palep is a tout in laparoscopy. The visiting doctors were assisted by the doctors from Jalukie’s community health center led by senior medical officer, Dr. DA Newmai. Hundreds of people availed the opportunity and medicines for free during the two day medical camps in the two areas. At the district hospital of Peren, a parallel medical camp was held with three visiting doctors, Dr. Jaydeep Palep, a robotic, obesity and laparoscopic Surgeon, cancer specialist Dr. Reshma, and Dr. Karmajit Singh, orthopedic surgeon. They were accompanied by Dr. Leimnayi Konyak, surgical specialist from Kohima. They were assisted by seven doctors and nurses from the District Hospital of Peren. More than 212 patients were treated during the camp. They also availed free consultations and medicines. Patients, public leaders and the public of the area are much grateful to the visiting doctors for having brought specialized medical advice to the doorstep of the poor and suffering in Peren district.